When updating the URL of an AD FS service, the first and most obvious things to change are the Service Communication Certificate, Name and Identifier. These are all changes that are exposed through the AD FS administration console or through Set-ADFSProperties and Set-ADFSCertificate. A couple of weeks ago Adam Lepkowski recommended an improvement to this section with the Set-AdfsSslCertificate cmdlet, which addresses some of the shortcomings I describe below. For coherence, I will leave my bits untouched, and include Adam’s comment here as an improvement that everyone can take advantage of. I think that seeing my clunkier approach actually helps reveal what’s happening under the hood, so I’m not going to change this content, but I will use Adam’s method in future myself. This command will add new entries for ports 443 and 49433 and update existing localhost binding. NB: I don’t recommend using .local. This is actually a domain that we’ve moved away from, but for this post it was easiest for me to use these resources. At any rate, these changes work, as they always have done. We can see the changes in Get-ADFSProperties and Get-ADFSCertificate clearly after making them. However, as before, we also need to apply these changes to the underlying infrastructure. In the past, this would be a matter of updating the IIS binding, but now we need to invoke the NETSH HTTP commands to interact with HTTP.SYS. The NETSH HTTP SHOW URLACL command unveils listeners, but by default AD FS will reserve a wildcard (+) listener for a port and path, for instance https://+:443/adfs/ or https://+:49443/adfs/, so there isn’t anything to change for the Host Headers (URL reservations). On the other hand, the SSL bindings may need to be updated and they are configured in a much stricter manner than we normally see in IIS (unless we’re using SNI). 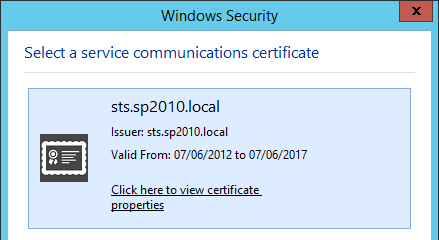 Indeed, the default HTTP.SYS configuration in Windows Server 2012 R2 assumes the use of TLS extensions like SNI. Using the NETSH HTTP SHOW SSLCERT command I will see that my current configuration still references the SSL bindings for my old SSL certificate and URLs. Although we shouldn’t rely upon the localhost binding, we’ll update that as well, as otherwise it will be secured using the old certificate still. You never know when failing to update this might cause a problem. And you’ll note there is no update command (that I can find), so we need to delete the old binding and create it anew. This would be a really good time to make sure certificate trusts are in place, all the way up the chain as needed. Things will break later if this isn’t done. And with that, the first changes are done. Once we have a responsive Security Token Service on our new URL, we need to update the Relying Parties that AD FS serves. There’s no way I could document all of these, but since this process is surprisingly poorly documented for SharePoint, I’ll detail what it looks like for SharePoint 2010 here. Before running this, it’s important to understand that updating the .Name value will break user profiles so I generally recommend against this. You need to live with the old Name and DisplayName, which may be confusing, but the alternative means migrating all user accounts and updating all Authentication Providers, which will be disruptive in a production environment. Making this update to the SPTrustedIdentityTokenIssuer requires use of the Get and Set cmdlets to make the change in full. 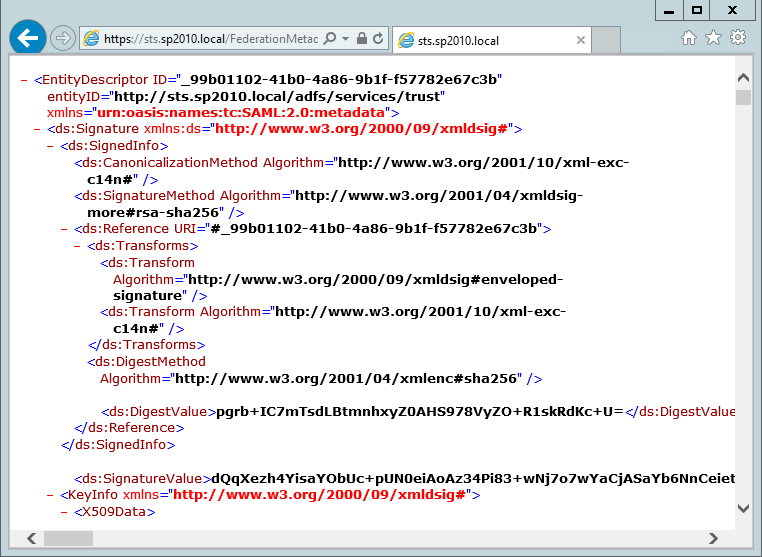 #Note: The ProviderUri parameter in the Get cmdlet equates to the SignInUrl in the Set cmdlet. Note: this process is dramatically better than the alternative approach of deleting and re-creating the SPTrustedIdentityTokenIssuer, as that will break any User Profile Synchronisation Connections that depend on it. Avoid! After making these changes, we should have a totally updated AD FS. But what if we’ve published AD FS and Relying Parties outside the corporate network using the Web Application Proxy? If so, our work is not finished yet. Before I plunge in too deeply, I have to mention that I’m not sure which of these steps (if any), will be needed if the Web Application Proxy is deployed for the first time after the changes above have been made. My gut feel is that none of them will be necessary, but for reasons that will become clearer soon, I can’t speak to that scenario with any clarity right now. Unfortunately, this change was insufficient to successfully proxy any of the Web Applications that had been reverse-proxied by this server. I did successfully re-establish communication with AD FS, and my old published applications were all visible in the Web Application Proxy administration console, but I couldn’t access anything from outside the network except for AD FS itself (via the Federation Metadata URL, as described above). All of my Relying Parties redirected to the old AD FS URL, but this was only happening via the reverse proxy. Reviewed everything in NETSH HTTP for possible changes. Double and triple-checked that all certificates were trusted by things that should trust them inside the infrastructure and on client machines. Un/re-installed the Web Application Proxy role. Deleted and re-created published applications. Turned off Windows Firewall (grasping at straws). Considered un-hardening my server in some manner (like I had to re-enable WinRM in order to remove the Web Application Proxy role, which got me thinking along these lines). Revoked all proxies in AD FS before un/re-installing. 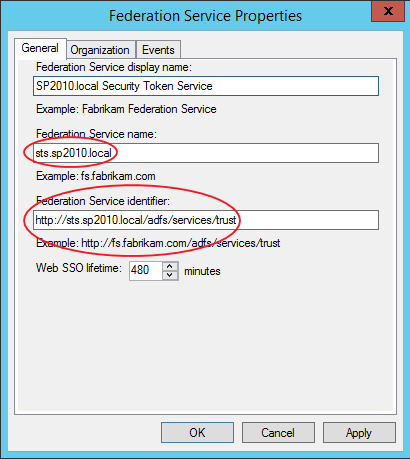 Tried to figure out why my Web Application Proxy server has a service called AD FS (which strangely, has a different Description than the AD FS server’s AD FS service). I’m finding this last bit particularly surprising. The Web Application Proxy is a Routing and Remote Access role that provisions a service called “Active Directory Federation Services”, which is the same name as the service that gets provisioned by the Active Directory Federation Services role, and they each have their own description. At this point, I made sure to undo any of this crazy stuff and went back to the beginning. I had already reviewed the URL reservations in NETSH HTTP SHOW URLACL. I found the port/path reservations as on my AD FS server, plus my reverse-proxied URLs. Nothing here appeared to warrant a change. Similarly, when I reviewed NETSH HTTP SHOW SSLCERT, I found that my reverse-proxied URLs continued to use the same certificate they were using before, and my new AD FS URL was bound with my new certificate via the original Install-WebApplicationProxy change. Finally, after making this change, I could access my reverse-proxied Web Applications. And with that, I now understand both AD FS and the Web Application Proxy a bit better. The NETSH HTTP commands aren’t controlling much that is outside of what you would have done in IIS before, although it enforces SNI by default. And although the Web Application Proxy servers are effectively stateless, some of the configuration state never gets updated unless the update is forced from a Web Application Proxy server. All of this is new for an administrator (some of it may be familiar to developers) and very little of this behaviour is documented today, so hopefully this post will help someone else in a similar position. Hi, great article, below one improvement. Hi Adam, thank you for this helpful article! I think you’re right Jay Dee. Since this is the certificate authentication port that would make sense. I will make the change above. Thank you. I have no idea why, if you have ever heard of this I’d appreciate an explanation. Otherwise save this tip for the future. Hi Christopher. Thanks for the tip. I have hit similar issues but I haven’t found the cause. I’ve even typed in the thumbprint. I definitely prefer your approach of grabbing it from the cert’s thumbprint attribute, which is how I would choose to script this. For the purposes of this post I didn’t want to distract from the core message too much so I simply pasted it in, but I think you’re right it would be better to update that bit of script. I’ll do that when I get a chance. Cheers! Can you modify the listening PORTS using this same method? For example change port 49443 to 8443? Great Article!! Helped me out. How to acces at the commande Get-SPTrustedIdentityTokenIssuer ? HKEY_LOCAL_MACHINE\Software\Microsoft\ADFS\ProxyConfigurationStatus to 1 instead of 2. This will then force the Remote Access setup configuration to rerun from scratch so you can do all the changes via the GUI. I only had Exchange reverse published but it seems to have done the trick. 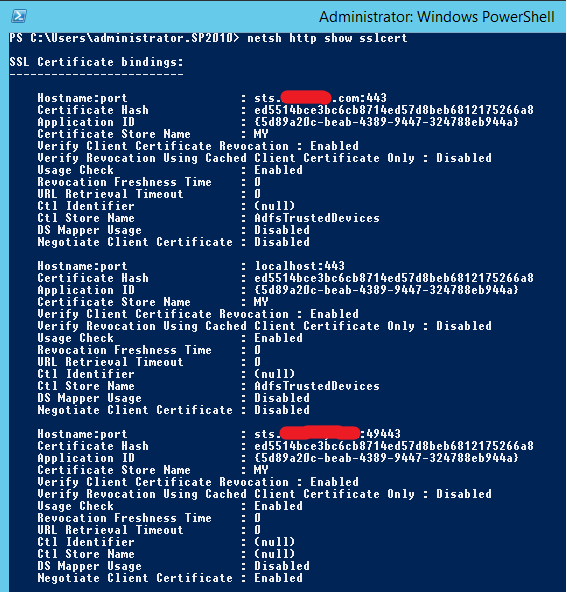 If your adfs server is adfs.contoso.com, and you import a wildcart cert of *.contoso.com into Adfs, then set the adfsSslCertificate, certauth.adfs.contoso.com immediately breaks. This is due to the additional subdomain after “adfs”. The wildcard doesn’t cover another down level domain. If you do a get-adfsSslCertificate, you’ll see certauth still bound to 443 on its original self signed certificate. 49443 is bound to the wildcard cert which I don’t think is right. 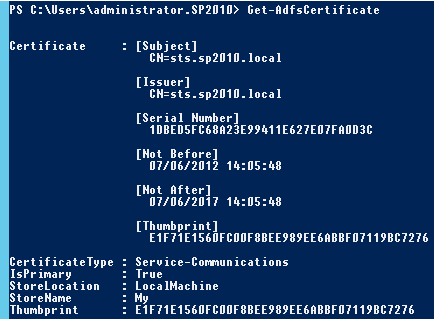 I think it should be bound to certauth on 49443 with the self signed cert. I did not fix it as I’m not using it’s functions. I’m assuming that we can adjust it with some of the commands from this article. On the WAP server, certauth doesn’t even appear any longer. Mark with the registry key really made the WAP process easier. I had so much trouble in an earlier attempt that I completely rebuilt WAP. This time it was clean, no powershell commands were needed. Toggling the registry key does not impact your existing published applications. Select your wildcard certificate, add your creds for admin access on the adfs server and done. This was exactly the right resource for my own dilemma. We have an F5 load balancer ahead of our ADFS 3.0 servers, but could never manage to get its health monitors to properly probe availability of the HTTPS service by IP address. The solution is to use “ipport” as opposed to “hostnameport” in the examples above.